Our members won’t want to give 45-minutes to hour of their time for an interview is a common worry among many association executives. But I find that members actually do. And there are two caveats: first, the association has to be so valuable or so important members want to give feedback and second, the members who actually want to give their feedback are almost always the best members. These best members are the ones who believe in the association, who get more value than most or who believe in the promise of the association. The good news is these are exactly the members we most need to talk to. They want to be a part of improving the association. They have some ideas and think they can be part of the solution. They get tremendous value and still believe the association can be even better. They believe the mission or the promise of the organization is critically important and they know the association needs to improve. They get tremendous value and they want to make sure the best benefits are left untouched so they continue to get tremendous value. They are giving about an hour of their valuable time but they feel their valuable time is not nearly as important as sharing their thoughts, opinions and ideas. Members want to be heard. If they are going to contribute they want to know their contribution will be used. Implicit in our ask to take an online survey, respond to a member interview, attend a focus group or even when we ask off-handed informal questions like what did you think of the conference? is the promise that we will act on the information we are receiving. Asking sets the expectation that we will act. You say act, what does that mean? I recently had a conversation with the CEO of a roughly 50 staff association. They are going through some massive cultural shifts as they reorient the decades old organization toward the future with a new focus on rapid innovation. One unusual process they’ve recently started caught my ear. They created a few formal channels for staff members to submit their great ideas (this is not so unusual). Each idea is vetted on an established set of criteria (still not that unusual). (This is the unusual part:) Each idea is responded to with the plan of action. If it is a no-go the submitter knows exactly why. If it is put into the new product process the submitter knows why, when and how. This kind of transparency primes the pump; when you trust that something will happen with your ideas you will be more willing to give them. How does this apply to member insights? 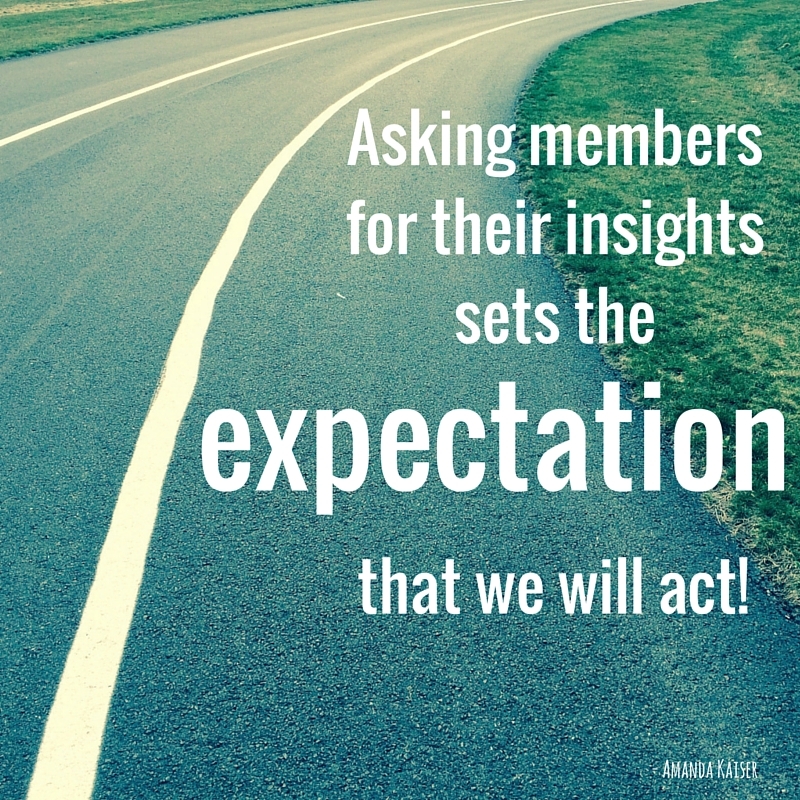 So often we ask for member’s thoughts, ideas and opinions but never loop around to let them know the outcome. A member giving their opinions is expecting action but that action doesn’t have to be an immediate grand plan to turn the association inside out and upside down. Instead it can be a simple: we heard you, we are so pleased you shared your insights with us and this is what we are doing with the information you shared. While giving a copy of the final report to each respondent is not feasible or even desirable I have two other options that I’m adding to each member research project going forward. The first option is a thank you letter explaining the process the insights will take. And the second option is a mini-report of some of the insights that respondents themselves may find useful or at least affirming i.e. this is the key professional problem most members are having and here is how one member is moving through it. Clients can choose which ever option makes the most sense for the association and their member respondents. I will be adding this new service at no additional charge because I feel strongly that we need to close the loop and let members know we are taking action based on the feedback they shared. Seth Godin talks about the problem with surveys in his recent blog post. If you are considering a member survey this post is worth your time. It is hard to take action on non-actionable data; but qualitative member research, specifically the phone interview method, is always actionable, every time.